Do yourself a favor, march over to the dollar store (or if your time is money, go on Amazon), and buy yourself a few packages of popsicle molds for Pesach. Buy a bunch because they break, and use them for the rest of the spring and summer. Fill them with juice and leftover smoothies for fun, affordable and delicious desserts. Then, laugh as you pass by over-priced desserts in the Pesach freezer section. Try some of these smoothies below for the molds. For peanut butter, substitute almond butter. Puree all the ingredients except the chocolate chips in a food processor. 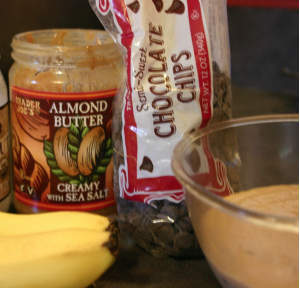 Add chocolate chips and stir. Freeze for at least 2 hours and then thaw for 15 minutes before serving. 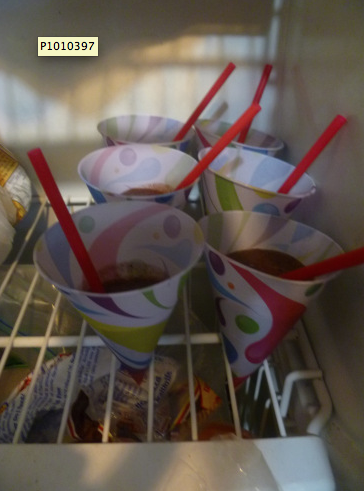 These will work in paper cups, popsicle molds, whatever!